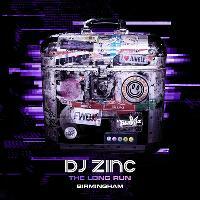 This Easter Thursday, the legend that is DJ Zinc takes us on a very special journey across his long and successful production career. This Easter Thursday on the incredible Void Acoustics sound system at Amusement 13, the legend that is DJ Zinc takes us on a very special journey across his long and successful production career. The Long Run is a one-off four set that will cover his formation years of Drum & Bass, Garage, Breaks, all the way up to his modern day Bass House influenced sounds. Go DJ!